We see a boy who was bitten by a lizard in a finger. He jumps from unexpected pain. The reptile hid itself in fruit. The artist places a wonderful still life between us and the teenager. Our attention is attracted by a vase in which there is a delicate branch of jasmine. Near the vase you can see cherries of red and green colors. In the vessel, the contour of which is bent, the room is reflected in a fanciful way. Before us is the most impressive genre still life. The artist could really realistically depict the instant reaction of the boy to the bite. It is likely that this is an allegory. 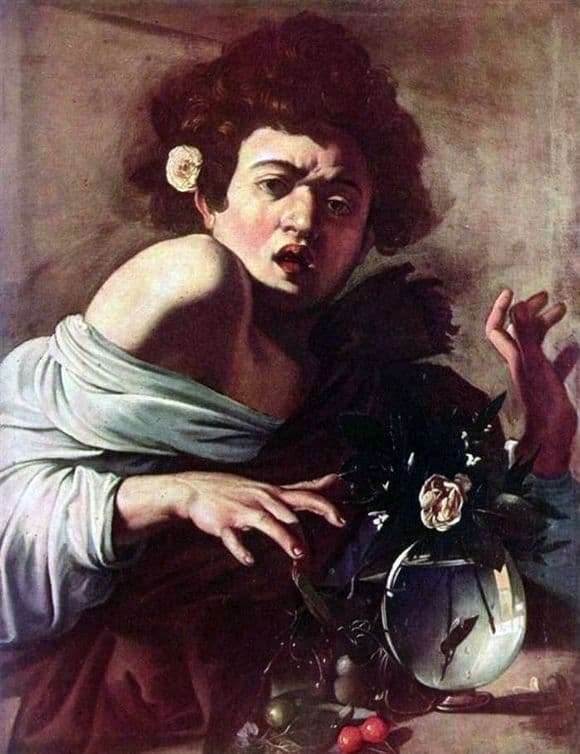 Caravaggio depicts the pain of the soul, caused him unrequited love. The artist uses all sorts of techniques. The light is contrasted. One shoulder, as if illuminated by the bright light of the searchlight, while the other is hidden. We can experience the maximum naturalism of the scene that the artist depicts. The viewer can feel the pain on the twisted face of the hero of his canvases. Well-groomed skin contrasts sharply with the dirt under the nails, which is typical of street boys. Caravaggio likes his own skill. He easily conveys all the details: the reflection of the door in a vase. But this stopped moment can be interpreted in different ways. Some researchers believe that this picture represents the pain that a strong feeling can cause. There are those who believe that we face an unusual metaphor for the fact that youth passes quickly. It is likely that the painter wanted to portray the suffering of love, which remained undivided. If we consider that Caravaggio depicts a boy with a rose behind his ear, then the correctness of such an interpretation is quite likely. As you know, this flower symbolized Venus. Cherry was also a symbol of reward for all virtues. You can interpret this work in different ways.